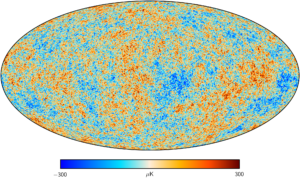 The Cosmic Background Radiation (CBR) – also known as the Cosmic Microwave Background Radiation (CMB or CMBR) or Relic Radiation – is thought to be the faint afterglow from the ‘fireball’ of the big bang, which has slowly been cooling in temperature since the Universe was created around 13.8 billion years ago. This electromagnetic radiation, which permeates space, is extremely uniform in every direction, and has the profile of a blackbody radiation curve, now centred in the microwave region of the electromagnetic spectrum. This radiation gives deep space its ambient temperature of 2.72548 ± 0.00057 Kelvin, i.e. approximately 3 degrees above absolute zero, or around -270 degrees Celsius. After the big bang, the Universe was an opaque plasma of electrons and protons, continuously absorbing, re-emitted and scattered photons. As the Universe cooled, the electrons and protons slowed to the point where electrons could be captured by a proton’s electromagnetic field, creating neutral atoms. At this point in time, about 379,000 years after the big bang, known as the recombination epoch, the universe became transparent to photons, which could then propergate unobstructed across the Universe. The photons of the CBR that are detectable on Earth today were each created at this point in time and hence arrive from the same distance in all directions of space, known as the ‘sphere of last scattering’. At the recombination epoch, the temperature of the CBR was around 3,000 K. Expansion of space causes the wavelength of the CBR’s photons to shift towards the red end of the spectrum, which has slowly cooled the CBR to the temperature of around 2.7 K, measured today. The fact that the CBR is so uniform in temperature in every direction of space is considered to be evidence of the inflationary model of the expansion of the universe. However, very small variations, or anisotropies, are present in the CBR, and these are considered to be due to random quantum fluctuations that existed when the Universe was smaller than a subatomic particle. These variations have grown, with the expansion of the Universe, to become the largest cosmological structures, seeding the galaxies and the clusters and galaxies that we observe today. 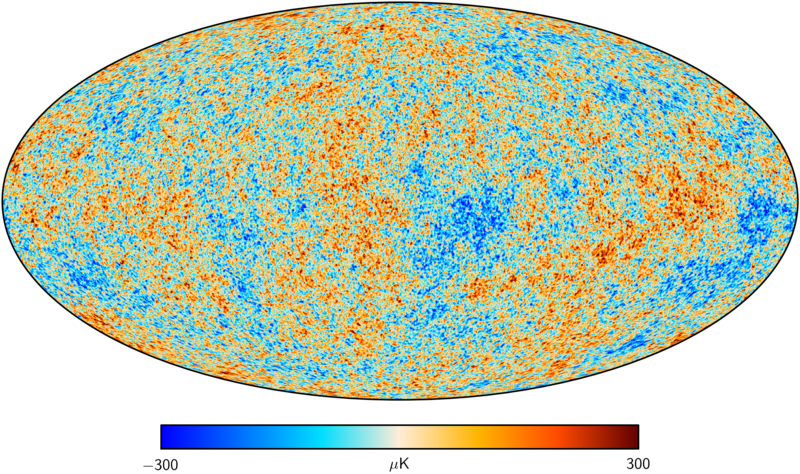 In 2013, the European Space Agency’s Planck space observatory produced highly accurate maps of these anisotropies in the CBR across the whole sky, providing us with our best estimates of several key cosmological parameters, including the average density of ordinary matter and dark matter in the Universe. This data has also allowed scientists to accurately measure the Hubble Constant and determine the age of the Universe as 13.82 billion years, based on the standard model of Big Bang cosmology. The CBR was accidentally discovered by American radio astronomers Arno Penzias and Robert Wilson in 1964, who originally thought the signal they had detected was caused by bird droppings on their equipment. However, the existence of the CBR had previously been proposed by George Gamow, Ralph Alpher and Robert Herman in the 1950s. This subsequent discovery of the CBR provided compelling evidence for Big Bang cosmological theories.